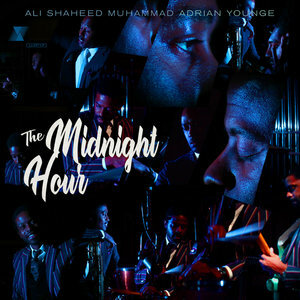 The duo behind the Luke Cage score (Adrian Younge and Ali Shaheed Muhammad) release The Midnight Hour, an all-star collection that was years in the making. Adrian Younge is an early riser/early worker, and so on the morning of our initial conversation, it's not surprising to learn that he's already in his studio. The chat starts naturally enough before being interrupted by other voices. There's a film crew at his studio, he says, on hand to shoot some interview footage with him and collaborator Ali Shaheed Muhammad about their score for the Netflix series Luke Cage. Our business is to discuss the pair's recent LP The Midnight Hour. The collection brings together elements of contemporary hip-hop, R&B, soul, and jazz with guest appearances from Cee-Lo Green, Raphael Saadiq, Marsha Ambrosius, Eryn Allen Kane, Karolina, and Questlove. There are deft touches from both men on these 20 compositions that celebrate the cultural sophistication of the Harlem Renaissance. In particular, Younge's penchant for drawing on unexpected influences (European film scores, early progressive rock) make their way seamlessly into the recording, resulting in a collection that is breathtaking, exhilarating. The project reaches back to 2013 and was interrupted by the pair's work on Luke Cage, among other endeavors. But it is not, according to Younge, their final work. Younge spoke with PopMatters about the origins of The Midnight Hour as well as working with Luther Vandross' estate and much more. You're known as a collaborator but primarily with other vocalists and not other producers, so how did you and Ali Shaheed Muhammad wind up together? As a producer, you're navigating the globe. You don't want too many captains. You want to steer the ship. But Ali has the same navigational skills that I have. When we come together, it's easier to create, and we create things that we otherwise would never have done. We make each other better. I have not worked with any other producer that makes me feel that way. It's great to work with somebody that things on the same page you do. Still, he'd come up with an idea in the studio that would blow me away because it was an approach I wouldn't normally take. Did Midnight Hour begin as a concept? We started off on the Souls of Mischief album that I produced, There Is Only Now, which I had asked him to be part of. We were just making music, and at one point I said, "Damn, it's just so much fun making music with you." I've never had that feeling with another producer. We just kept writing music, and pretty soon we realized that we were creating an album. Then we realized that we were actually making music for a group and that this was our first album. You have "So Amazing" with vocals from Luther Vandross on the album. We became close to his estate. We pitched the idea of making new music with him on it. We just started making music with his vocal stems. This was one of the songs that they allowed us to put on the album. Does that mean that there was other material that might see the light of day? The answer is yes, but I can't talk about it too much. We'll see what happens. It's in their court, basically. What did you learn about him from working with his vocal performances? That he was a consummate professional. His vocal prowess is incredible. We'll never have a vocalist like him again. He studied the best and incorporated that into his own work. He created a new way of singing beautiful ballads. Listening to his music, I realize how much we really miss him. I also wanted to ask about Raphael Saadiq and the tune "It's You". He was a fan of my Black Dynamite soundtrack and my work with Delfonics. We met through my publisher. I've been a fan of his since I was a young man. I was in junior high when "Feels Good" and that other stuff from Tony! Toni! Toné! came out. Meeting him was an honor but what was an even greater honor was becoming really close friends with him. He'd already known Ali for a long time and had been in Lucy Pearl together. All of us coming together as solid friends is really just a blessing. You can see footage of us making that song on my Instagram page. What kind of environment do you try to create in the studio? I definitely make the vocalist feel relaxed, but at the same time, I want them to be ready to perform. There's nothing digital in my studio. When you don't have digital you can't do a bunch of takes, then cut and paste. I want them to come in ready to give their greatest performance because when Ali and I are creating tracks, that's what we're doing. We expect the same thing from our vocalists. You probably have musicians who are encountering tape for the first time when they work with you. Many times. And they love it. There's never been anybody that's complained because they get to hear how it actually sounds. Digital recording is an emulation of tape, so when you actually hear the real thing, it's going to hit you differently. It hits them immediately. You and Ali had started working on Midnight Hour and then that was interrupted by Luke Cage. When was that project presented to you? Cheo Hodari Coker hit us both in 2015 and asked us to be part of it. It was an immediate yes. It came to fruition when we met with Marvel. That was probably three months after the initial request. It was enough of a dream for us to actually put Midnight Hour on hold. We were making a show and entering the Marvel universe. That means that we get to share our music with the world. Whenever I mention Luke Cage to someone they always mention how much they love the music. We wanted to make the music like an extra character. We took a classic film approach to television. We didn't want just a keyboard patch here or a keyboard patch there. We wanted to use a real orchestra, real instruments. We're glad that people responded to it. Does this open the door for more projects like that? Absolutely. We're going to be doing music for a project called Raising Dion. We're going to do music for Run This Town, the movie about Toronto mayor Rob Ford. It also strikes me that it would be really cool to have a Midnight Hour long form video. Do you have any plans for something like that? We taped the recording of the orchestra, the performances, so we do want to do something with it. We'll see. We need to see if there are any partners that want to help us get it out there. But we do have a lot of good footage. Do you have albums that, as a producer, you still want to make? I have an album with Snoop that's going to come out soon. We just finished recording the orchestra two days ago. It's a crazy, crazy album. It's like a '70s Blaxploitation album. That's something I've been working on for five years. The other thing that Ali and I are working on is an opera. We're trying to figure that out as well.